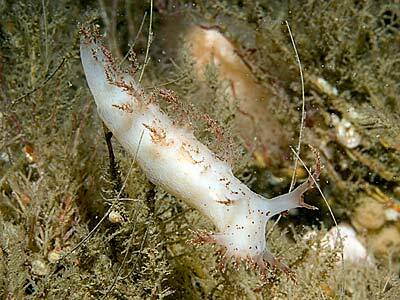 MOLLUSCA : NUDIBRANCHIA : Dendronotidae SNAILS, SLUGS, ETC. 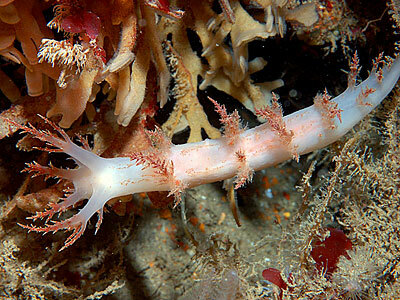 Description: This nudibranch is very variable in colour and has been suggested to be a complex of several species. Individuals may be white or mottled with yellow, red or brown pigment. There may be up to nine pairs of gills along the pallial rim. The gills, oral veil and rhinophore sheaths are extended to form branched processes. Adults may grow to 100mm in length. 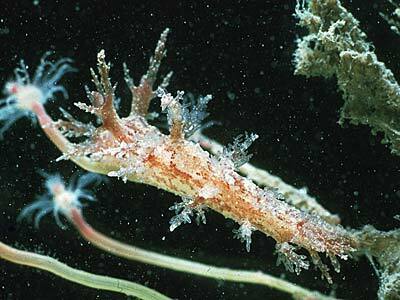 Habitat: Dendronotus frondosus feeds on a variety of hydroids. Juveniles usually feed on Obelia, Halecium and Sertularia, whilst the adults are commonly found on Tubularia. It is possible that not all individuals are the one species as some spawn at a small size. Distribution: Dendronotus frondosus can be found all around the British Isles. The species range extends southwards to the Atlantic coast of France; eastwards to Canada, the United States, and the Pacific coast of Canada; and northwards into the Arctic circle. 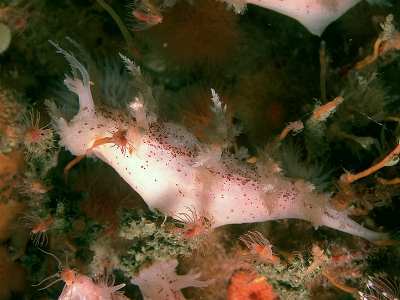 Similar Species: The arborescent gills, oral processes and rhinophoral sheaths distinguish this nudibranch from any other in the British Isles. Large arborescent gills arising from the mantle edge. Arborescent processes on the edge of the rhinophore sheaths. Picton, B.E. & Morrow, C.C. (2016). Dendronotus frondosus (Ascanius, 1774). [In] Encyclopedia of Marine Life of Britain and Ireland.